Why not make your lunch that bit more special by selecting the deluxe list of fillings for an additional £1.25 per person? Please contact us for information on finger food items as they change daily and for any special requirements. The minimum order is for 4 people. Please order by 2pm for delivery by 12 noon the following day. For orders after 2pm please call 07977264762 for available delivery times. 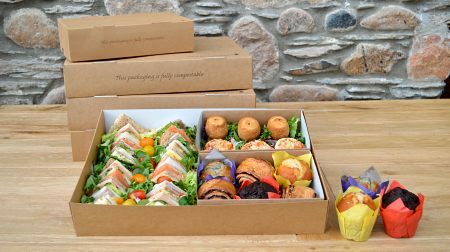 This will be delivered to you in one of our stylish (and fully biodegradable!) boxes.